We, the people of Plain City, Utah through our Committee for the men in Service with the aid of the people in the community do erect and dedicate this memorial, of everlasting granite, to honor the memory of those who, from our community, were enlisted and served in the Armed Forces of these United States of America and fought for its principles of Freedom, Justice and Democracy in the Second Great World War, which we have faith will culminate as all our country’s wars have, in victory. Today, August 26, 1944, when hostilities have been raging for 32 months, as we solemnly and proudly honor all Servicemen and Women, especially those who left from our community, and whose names are cut and will be cut in this monument, this war, cruel and savage beyond description is being waged across the seas, gravely threatening to destroy our freedom. May God and justice destroy the forces and the barbarous leaders of those aggressor nations before they make it necessary for this nation of ours to again, by force of its arms, defend itself and the principles on which it was founded. We, as a people are deeply grateful for the service and sacrifices made, not only the men who served in this war, but of all those who fought and for those who died to defend this great nation since the first clash of arms in the battles of Lexington and Concord, we honor and revere the memory of them all. So in the erection of an everlasting memorial those, who left this country beginning 32 months ago to serve in the Armed Forces of these United States, to keep alive the flame of liberty and pass on to our posterity the stories of their brave and noble deeds, even beyond the time that this granite shall have crumbled to dust obliterating the names carved here on. May we never again be called to erect other similar memorials because our country was again at war. But rather, would we as a people whole heartedly join together to sponsor a shaft to commemorate the beginning of an era of eternal lasting peace without the horrors of war. 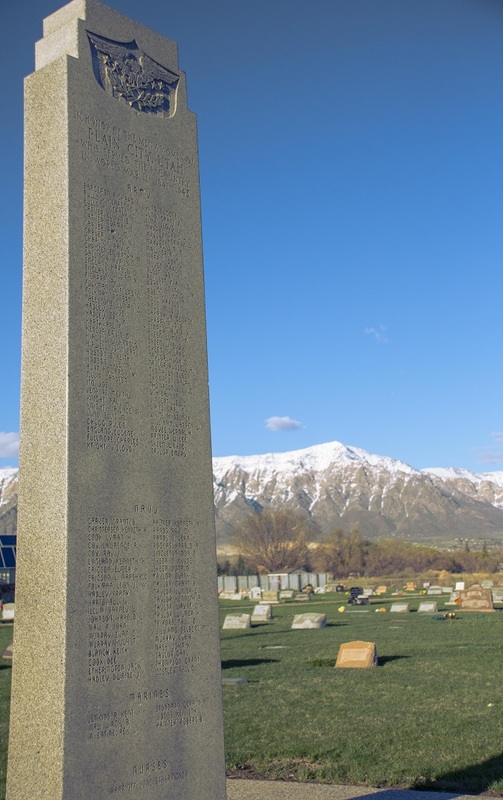 A group of men from Lehi came in the fall of 1858 and looked over the town, they also made a preliminary survey for a canal site, using a sixteen foot two by four grooved out and set on a three-legged tripod, with water in the groove to act as a level. This preliminary survey was made to the big levee that fall of 1858, some work was done on the big levee that fall, until it was necessary for the men to return to their homes in Lehi. On March 17, 1859, a company of about 100 people arrived in Plain City about 5 o’clock in the afternoon. They camped in a hollow in the south part which later became Samuel Draney’s lots. The wagons were lined up east and west for protection against the north winds. Although snow was deep, they soon dug a big hole and built a fire making it as comfortable as possible. One of the first things to do after arrival was to survey the town-site and assign lots to the settlers, so they could get some kind of shelter for their families. Joseph Grue states that John Spiers and others who surveyed Plain City had in mind their old home, the city of Nauvoo, and followed the pattern as nearly as possible. They surveyed the town at night using the north star and three tall poles just below it, as a working guide. The measuring chain was a piece of rope which they dragged along over the deep snow through which they waded. The original plat was six blocks long and three blocks wide, running north and south. Each block contained five acres and is divided into four lots. Each settler was allowed some choice in the selection of his lot, and each settler was alloted twenty acres of farm land on the out skirts. The Plain City canal was commenced in May of 1859 shortly after part of the crops were planted, and completed to four mile creek that first year and later to Mill Creek and then to Ogden River, which relieved the situation somewhat during seasons when water was plentiful, but was of little benefit in dry seasons, the Plain City irrigation company under the supervision from the beginning. Mr. Rollett, a Frenchman, introduced the culture of asparagus to Plain City, the seed came from France in 1859. This became one of the leading industries of Plain City, as the soil and climate are especially adapted to its culture. Plain City asparagus has become known far and near, and at the present time the asparagus in handled by the Plain City Asparagus Association. They ship asparagus to all parts of the United States. Early homes were dugouts, then log cabins and later adobe. The first stone house was built by William Skeen in 1862 or 1863, by hauling rock from Hot Springs, northeast of Plain City. The first school and meeting house was built in 1859. It was of log and adobe and was located on the south side of the public square. This adobe building was used as a meeting house, school house, amusement and dance hall for a number of years. George Musgrave was the first Plain City school teacher. His first school was held in his dugout on his lot. The first Relief Society was organized January 3, 1868, with Almira Raymond President. The first Primary was organized in 1881 with Susannah Robinson President. The first Mutual Improvement Association was organized in 1876 with William England as President. An Episcopalian Church was built in 1877, and was used as a school and church. At that time, it had about 75 members. The building is still standing and still in use (Lions’ Club House). Evelyn Sharp was the first white baby girl to be born in Plain City, and Thomas Singleton was the first white boy. They were born in 1859. People of Plain City have always fostered amusement and entertainments of various kinds. In the early days they always had a brass band, a choir, dramatic association, and a baseball team. Regardless of all the hardships endured by the early settlers, recreation was always enjoyed. Dances were held in the old adobe school house on the south side of the square in winter and in the bowery near it in summer. They danced on the hard dirt floor at first, many of them in their bare feet. Most of the dances were square dances, at various times music was furnished by comb bands. The first real meeting house that was built expressly for ward purposes is the present brick structure commenced in 1884 and finished in 1889. The following men have been Bishops of Plain City Ward since it was first organized in the order listed: W. W. Raymond, L. W. Shurtliff, George W. Bramwell, Henry J. Garner, Henry T. Maw, Gilbert Thatcher, Wilmer J. Maw, George A. Palmer, Charles Heslop and the present Bishop Elvin H. Maw. Plain City is principally a farming and dairy community, with sugar beets, onions, tomatoes, potatoes, peas, grain, alfalfa and asparagus being grown as the principal crops. A branch of the North Ogden Canning Factory is located in Plain City and tomatoes are grown and processed each year. The canning factory was completed in 1925. Many of the men of the community have profitable dairy herds, and each year a “Dairy Day” is held on the town square, prize stock being shown. Stock is shown from all parts of the state. A Junior High School is located in the center of town, where approximately 225 children attend. L. Rulon Jenkins is now the principal of the school. At the present time, Plain City has a population of approximately 800 inhabitants. Each year on March 17 a “homecoming” celebration is held to commemorate the settling of the town. Plain City was incorporated this year of 1944 with the town board as follows: Dean Baker, Chairman, W. Albert Sharp, Fred L. Singleton, Floyd A. Palmer, L. Rulon Jenkins and Don E. Carver as Secretary. The committee for the servicemen was selected about one year ago, and appointed by the Ward Bishopric, for the purpose of paying tribute and honor to the fellows and girls who enter the service. The first funds were collected through a scrap iron drive, which was initiated by Dean Baker. The support of all the people of Plain City was gained by soliciting, and many tons of iron was donated by members of the town. The task of securing the names to be placed on the monument and helping to plan its erection was done by the Committee for the Men and Women in the Service with William Freestone as Chairman, Elbert J. Moyes, Elmer P. Carver, John A. Hodson, Dean Baker, Mrs. Frank V. Skeen, Mrs. W. Albert Sharp, and Mrs. Vern L. Palmer. As the original plans for the erection of this memorial called for only those who had been honored at Plain City, we deeply regret that names of some of the fellows who are in the Service, who have been residents at some time previous to their entering the service, will not appear on this monument. We, the Committee for Servicemen, representing the people of Plain City extend our thanks and heartfelt appreciation to all individuals whose combined efforts have made the erection of this monument possible. The primary objective of this committee is to uphold and defend the Constitution of the United States of America and be of service to the community, state and nation and to transmit to our posterity the principles of justice, freedom, and democracy. This everlasting and beautiful monument is sturdy and tough and is truly symbolic of the sterling qualities and character of the men whose names it will bear until it shall have been worn away to dust by the elements of time, and returned to mother nature from~when it came. As duly requested this document was written and prepared by Mrs. Frank V. Skeen, Mrs. T,i, Albert Sharp, and Mrs. Vern L. Palmer, together with the aid of the other members of the committee, and whose sincerest hope and aim was that the full honor and credit due, is bestowed on the citizens of Plain City who form a part of the great unit by which this nation was founded and is governed. May the heritage of these rights of quality and self government never be taken away from those to whom it rightfully belongs the people.